Norland Epperston 1 Room Log Cabin: The Norland Epperston 1 Room Log Cabin is a spacious one room log cabin with a covered front extension perfect for relaxing and enjoying the garden. The interior lets in lots of natural light and is well ventilated, with a large bifold door and three tilt and turn windows on the cabin’s side. The 14.94m/sq floor area means that the interior of the cabin can easily accommodate a furniture set, providing a highly functional space. There are 28mm floor boards throughout, and with 70mm wall logs the delightful cabin is well protected from noise and weather. 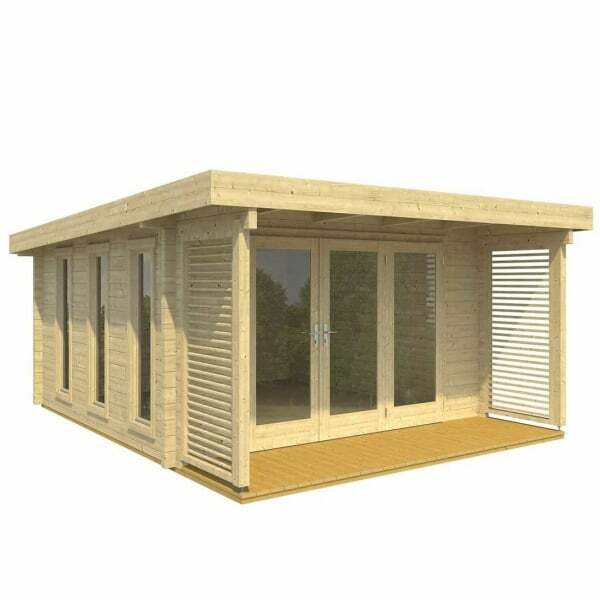 The Norland Epperston 1 Room Log Cabin is easy to assemble and are an extremely sturdy structure as they are built in the traditional Log Cabin style and therefore uses no screws or nails in the wall construction. The Norland range also feature chalet corner jointing to give that extra timber jointing for extremely good weather resistance.